After 8 years, refugees still reluctant to return to Syria. LEICESTER, United Kingdom – Although diplomats met with officials in Syria this week to ease the return of refugees to the country, it is doubtful they will be going home soon. Sporadic fighting continues in the country, and much of the infrastructure – including schools and medical facilities – has been destroyed. It is estimated that over 5 million people have fled the Middle Eastern country during its 8-year-long conflict, along with over 6 million others who are internally displaced within Syria itself. Over 1 million refugees are in neighboring Lebanon, which only has a population of 6 million. “Host communities have been very generous, they have welcomed Syrian refugees in their hour of need, but eight years on from the beginning of the conflict, cracks are beginning to show,” said Elouise Hobbs, who works for CAFOD, the international aid agency of the Catholic Bishops’ Conference of England and Wales. Hobbs recently returned from a visit to Lebanon, where CAFOD runs several projects to help the refugees. Lebanon has experience with civil war – its various religious factions fought each other from 1975-1990. Lebanon’s fragile balance between Christians, Sunni Muslims, and Shia Muslims had been shaken by an influx of Palestinian refugees. Hobbs told Crux one project CAFOD has co-sponsored with Caritas Lebanon is ‘Youth Resolve’ – bringing young Lebanese and Syrians together to help forestall any similar problems. “It’s bringing the Syrian and Lebanese people together – usually they are from different religions, different backgrounds. They wouldn’t usually mix or speak to each other to solve some of these tensions,” she said. Hobbs said the young people are doing things such as renovating public spaces, planting trees, and painting play areas for children. “It’s breaking down barriers,” she said. Italian Filippo Grandi, the UN High Commissioner for Refugees, visited refugees in Lebanon earlier this month. “After eight years of this terrible war, the impact on Lebanon is very heavy and this cannot be taken for granted by the international community,” said Grandi. On the agenda of his visit was the return of refugees to Syria. Yet according to Hobbs, most aren’t ready to go. “When there is a conflict that has been going on as long as this, people want to return home. They want to go back to what they know,” she said, but the ongoing fighting and widespread destruction are deterring them. “The conflict in Syria, although it seems it is coming to an end, it hasn’t officially ended yet. There is no political settlement in place, or an end to the war in place. Until there is an end to the war, there can be no guarantee of safety to those who return,” Hobbs told Crux. At the beginning of the year, a huge storm inundated several camps, causing an urgent need for items like mattresses, blankets, clothes, hygiene kits, and plastic sheets. “Even before the storm, refugees were living in poor conditions – many of the camps are built on farmland, which is prone to flooding. This combined with wind, rain, snow, and freezing conditions is enough to push the situation from precarious to catastrophic,” he said. On Friday, the UN Secretary-General’s special envoy to Syria, Geir Pedersen, met with Lebanese President Michel Aoun. At the top of the agenda was the refugee situation. 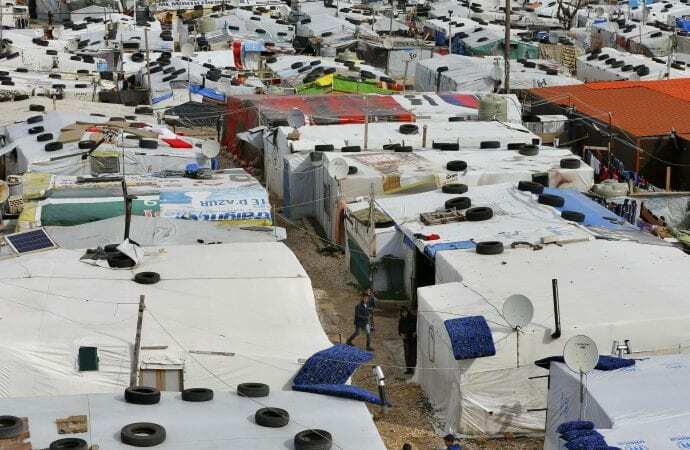 Aoun said that Lebanon “can no longer bear” the consequences of the large number of refugees in the country. “We must work seriously to take refugees back to safe zones in Syria,” he said. The president also called on those countries that have supported factions in Syria’s civil war, which has killed over 300,000 people, to do more financially to support the refugees the conflict has caused. “If the countries involved allocate 10 percent of the cost of the Syrian war to resolve the refugee issue, it would help resolve their humanitarian crisis and spare the world more crises,” Aoun said.